It’s a rite of winter in big Eastern cities. Salt and chemicals put on the road to melt ice and snow drip down into manholes, and eat away electrical wires which in some cases around Brooklyn are 60-plus years old. Result: Electrical fire. Big booming electrical fires, and exploding manhole covers. We wrote about this a while back. And that’s what happened yesterday on Court in front of Park Natural health food store. Smoke was seeping from the manhole for hours, but when the big booms happened, and the billowing smoke streamed out from the underground fire, about 10 fire trucks and engines converged. It was all blinking red lights and smoke. It was a scary moment for the folks in Park Natural and other shops around there when all the smoke came rushing in. Con Edison takes care of the electrical fires — they pretty much have to let them burn out and then fix and replace the wires. The FDNY stays on hand to make sure it’s all under control. This summer, a manhole fire in Clinton Hill spread to nearby buildings. 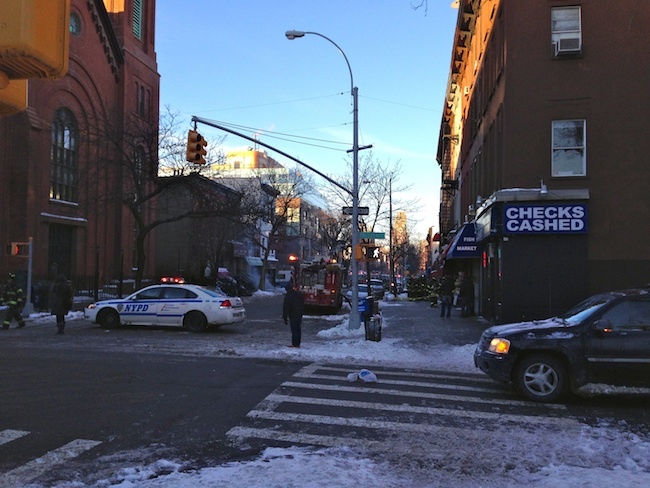 We had an exploding manhole on First Place between Clinton and Henry in mid December. It’s surreal listening to the hissing and popping and exploding. New York Daily News has some good photos of yesterday’s Court Street fire.